This is the latest in a series of posts as i #WorkOutLoud on new research and writing on ‘Types of Trust’. It’s based on an exploration of the subjective notion of ‘trust’, and a desire to surface a workable framework for ‘Types of Trust’, something that we can use to benchmark an organisation against wider norms. I fully expect this to be challenging, and to have both sector and regional differences, but for now i’m just taking small early steps to prototype questions and uncover reasonable pairings. Today, i want to explore the third and fourth of the prototype questions, which are linked and which, i think, provide a useful insight. These questions concern what makes us feel ‘valued’, and what ‘trust’ means to us. I present this as a commentary on initial results, not a frame that is set in stone. The first question i asked here was, “What makes you feel ‘valued’ at work?”. I got 431 responses to this (which, out of interest, was the highest response rate to any of these prototype questions), and the results were as follows. 35% of people reported that ‘Reward’ makes them feel valued, 25% rated ‘freedom’ as their top choice, 18% gave ‘Development’ as the answer, and 21% said ‘Choice’ itself. Before analysing these responses, let’s look at the second question: “Which of these words best describes what ‘trust’ means to you?”. In this case, i had 303 responses, which broke down as follows: 14% said that ‘Predictability’ best described what ‘trust’ meant to them, 54% said ‘Freedom’, 19% reckoned it was ‘Reward’, and 13% said ‘Other’, with their suggestions including ‘Safeguarding’, ‘Appreciation’, and ‘Feeling Heard’. From these two questions, I think I can draw my first insight: for people to feel ‘valued’ may need ‘reward’, but to be ‘trusted’ may need ‘freedom’. We can infer what may seem like an obvious distinction, that ‘value’ and ‘trust’ are separate dimensions of engagement, and hence may be affected by different factors. I believe this is significant, because we normally talk about generating engagement, whilst it may be that we need to think about earning trust, and being valued, the output of which may be engagement. Rewarding people may make them feel valued (35%). 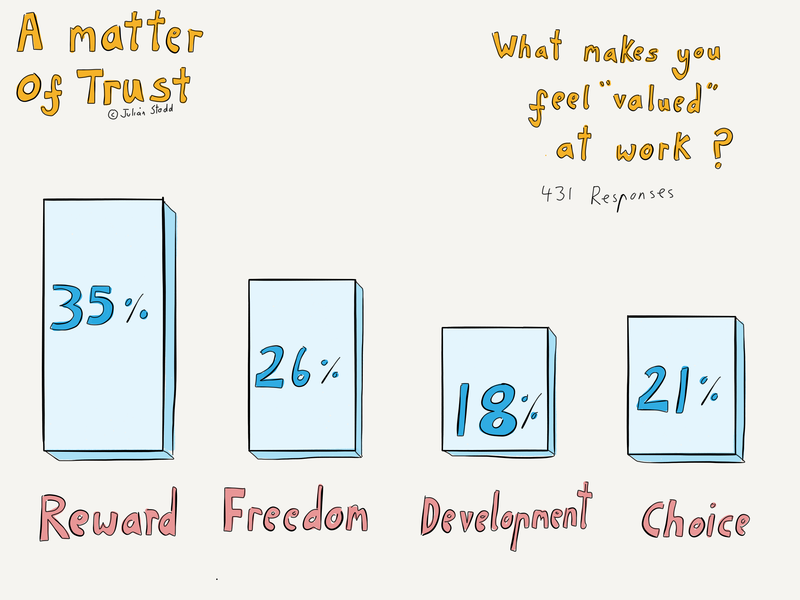 Giving greater freedom also makes people feel valued, but not as strongly (25%). To counter this, ‘freedom’ is a key component of whether people have trust in the organisation (54%, a whopping 54%, the highest percentage in any of these prototype questions), whilst ‘predictability’, something organisations aim for, has a comparatively low effect (14%). Let’s think about each of these questions in turn, starting with the question about what makes people feel valued at work. ‘Development’ came last with only 18% of the vote. We could hypothesise that development opportunities may be valuable, but may not make people feel valued. Does this service the notion that feeling valued is a different thing from adding value. In other words, as an organisation, we can take actions that add value to people’s personal development or career, but those actions may not make them feel valued. From my point of view it’s interesting, because development opportunities are one of the options we have open to us to reward social engagement. It may be that by phrasing them as rewards, rather than development, there may be a different perception, or that may simply be trying to cheat the system. ‘Choice’ garnered only 21% of the vote, although I realise in retrospect that we may have split the vote with ‘choice’ and ‘freedom’ meaning something similar. I may test this pair separately to explore that. From earlier interviews, I expected that ‘freedom’ would rate highly. Indeed in the first interviews I did, freedom ranked top. But in this survey, and only 26%: a sizeable chunk that may reflect that people feel valued if there is less direct oversight over their day-to-day activity, if they have greater freedom to explore new ways of doing things, or simply feel that they are trusted to get on with their job. It will certainly be interesting to explore what freedom means to different people. 35% of people said the thing that makes them feel valued at work is ‘reward’. In an earlier piece exploring types of trust, I described my concern that when trying to quantify subjective experiences like trust and value, we can end up building houses made of sand, with one subjective interpretation nested inside another. To feel valued, people wish to be rewarded, but reward itself is subjective. Clearly I will need to break down the notion of reward, and understand how financial reward ranks against reputational reward, or if there are other types of reward, such as access to opportunity. 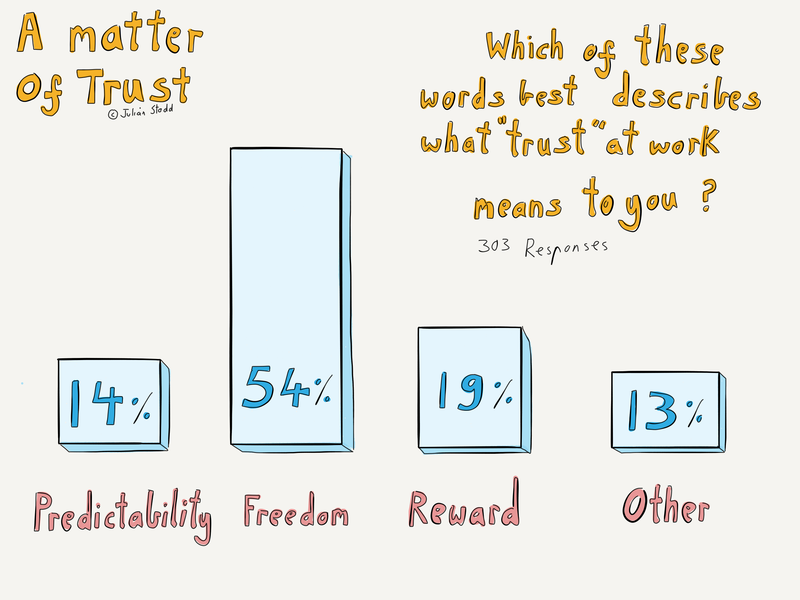 The second question explored which words best describe what trust at work meant to people. Again, I was somewhat surprised, as in earlier interviews, ‘predictability’ had rated highly. In this survey, it only drew in 14% of the vote. ‘Reward’ came in at 19%: reward, which we know makes people feel valued, is less significant apparently in making them feel trust. The thing that makes people feel ‘trust’ is ‘freedom’. At this stage, I can only draw the same conclusions as I did for the previous question: that people feel trusted when we give them freedom to get on with the job. This may indicate that too much oversight, system, process, and control, too little ability to experiment, or too high a sense of consequence may impede our ability to earn trust. I talked in an earlier piece how this stage of research can be the most bemusing. as we start to put structure and definition around certain terms, we inevitably share different understanding of what they mean. At this early stage, I believe that much of my challenge is to continue to break down the subjective terms and explore which terms resonate most strongly, which turns are most clearly differentiated, and see how we can pair them up. These are not pairings of opposites: is not particularly a case of whether people feel trust or the opposite of trust, if indeed we can define the opposite of trust. It’s more a case of where trust is absent. What can we do to create the conditions in which it can be earned. I will continue to #WorkOutLoud as I explore these ideas further, trying to come up with a pragmatic and reasonable framework to benchmark and diagnose the types of trust that exists within an organisation. This entry was posted in Trust and tagged Choice, Freedom, HR, Leadership, Predictability, research, Reward, Social Leadership, Socially Dynamic Organisation, Survey, Trust. Bookmark the permalink.